These buttermilk pancakes are a healthy breakfast alternative to morning toast and quick to make even when busy. On Saturday mornings our kids love to help with adding and stirring the ingredients. Adding 1/2 cup to a cup of blueberries to the remaining batter once we have cooked half of the pancakes gives a nice variation for our kids to choose between plain simple pancakes and blueberry pancakes. 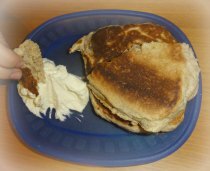 I will guide you through this healthy pancake recipe so you and your family can enjoy these pancakes as much as our family does. Combine all 'dry' ingredients in a large mixing bowl and set it aside. Fold the egg whites(step #3) into the batter(step #2). 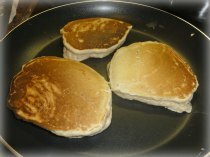 Pour or scoop batter onto a griddle or frying pan at medium heat to the desired pancakes size. Cook each side to golden brown. Watch for the air bubbles coming through to signal the time to flip over the pancake. Don't multitask or your pancakes will burn. We like to switch it up from one week to the next--one week medium to large pancakes and the next week small, 3 or 4 scoops into the frying pan at a time. 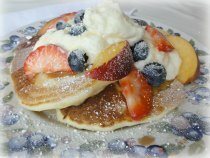 Have fun and enjoy these homemade pancakes with buttermilk. I always feel healthier when I know exactly what I have put into the foods I'm making and eating. We can get between 15-20 medium size pancakes from one batter. Small scoops will make around 25 pancakes. After a couple of trial runs you should be able to get the batter prepared in 15-20 minutes with another 10-15 minutes to get it all cooked. 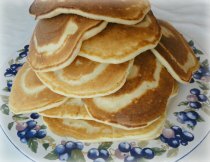 Enjoy these quick and healthy buttermilk pancakes with your whole family.